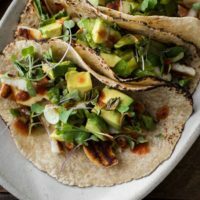 Grilled Scallion Avocado Halloumi Tacos | Naturally.Grilled Scallion Avocado Halloumi Tacos | Naturally. Remove the halloumi and scallions from the grill and let cool slightly. Chop the halloumi into smaller strips and mince the scallions. Dice the avocado into small cubes and place in a bowl along with the chopped scallions, lemon juice, and salt. Toss to combine. Assemble the tacos with roughly 1/4 of the cheese, 1/4 of the avocado mixture, cilantro (or micro greens), and a splash of hot sauce as desired. Tips + Tricks: This would also make an amazing salad or grain bowl!